Phar Lap’s skeleton is one of Te Papa’s best known exhibits. Perhaps the most famous horse ever to emerge from Australasia, the national identity of Phar Lap is as intensely debated each side of the Tasman as is who invented the pavlova. Foaled at Seadown, near Timaru, in 1926, Phar Lap was bought by the Sydney-based American businessman David J. Davis in 1928, and was trained and raced in Australia. He dominated the Australian racing scene during the Great Depression, providing the one sure bet during desperate economic times. In the four years of his racing career, Phar Lap won 37 of 51 races he entered, including the Melbourne Cup in 1930. He improved with age, including winning 14 races in a row in 1930-31, and winning 32 of his last 35 starts. Davis had him shipped to North America (against the wishes of co-owner Harry Telford), where he won his only race there – the Agua Caliente Handicap – in race record time. He died in mysterious circumstances soon after the race, on 5 April 1932. Following his death, Phar Lap’s enormous heart was donated to the Institute of Anatomy in Canberra (it is now in the National Museum of Australia, Canberra), the mounted hide is in the Melbourne Museum, and the skeleton was first displayed in the Dominion Museum (now Te Papa) in 1938. The skeleton was loaned to the Melbourne Museum in September 2010 as part of the celebrations for the 150th running of the Melbourne Cup. Displayed alongside the magnificently taxidermied hide for the first time, it was clear that the skeleton was overdue for a makeover. Te Papa staff had long debated whether it was more important to maintain the 1938 articulation as an historic exhibit, or whether to re-articulate the skeleton in an anatomically more correct posture. The latter argument has finally been accepted! The 1938 articulation was done by Dominion Museum taxidermist Charles Lindsay and osteologist E.H. Gibson of the Otago Medical School. Given that neither man was an expert in equine anatomy, they did a remarkable job. But there are a series of minor errors that collectively mean that the skeleton does not quite match the proud physique of Phar Lap in his prime. This was exacerbated by metal fatigue of the rod holding up the neck and skull, resulting in the skull drooping from its original position. 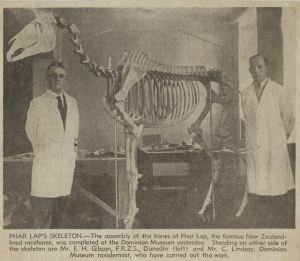 Phar Lap’s skeleton has been returned to Te Papa, and a team is working to have the skeleton re-articulated and back on display early in 2012. A crucial member of the team is retired associate professor of veterinary anatomy Dr Alex Davies. Dr Davies has had a long interest in Phar Lap, and is relishing the opportunity to work alongside Te Papa staff in making sure that the re-articulation is as accurate as possible. One of the key decisions in the re-articulation process is to present the skeleton against a life-sized image of the Phar Lap mount from Melbourne Museum. We intend to match the posture of the skeleton closely to that of the skin. The physical work is being undertaken by object conservation staff Robert Clendon and Hayden Prujean, with expert advice from Dr Davies. Some of the changes that have already been made include increasing the length and curvature of the spine, and lowering it at the front to increase the projection of the shoulder blades above the spine. More subtle adjustments include improving the position of the minor limb elements, including the patella (knee-cap) and sesamoid bones. Thank you Te Papa, awesome facts! Phar is more an Australian national icon than just the most famous Aussie racehorse of all time. The questions that have hung over his death are also the basis of Australia’s longest running conspiracy theory. Was Lap’s death the result of foul play or was it just bad luck that the famous horse collapsed and died soon after winning his first race in the US? Actually, Phar Lap never raced in the U.S.. Phar Lap’s only race in North America was when he won the Aqua Caliente Handicap in 1932. The Aqua Caliente race course was located in Tijuana, Mexico. Phar Lap won the race in record time. After the race he was shipped north to San Mateo County in California to prepare for the Tanforan Handicap. Unfortunately, Phar Lap died, most likely from an accidental ingestion of arsenic on April 5, 1932.